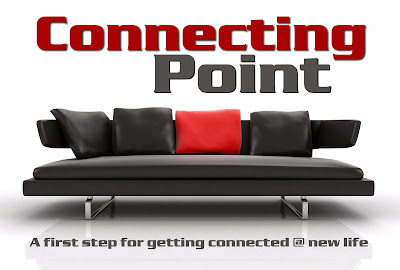 Connecting Point is a great first step to get connected at New Life. It's a forty-five minute lunch that is designed to help you learn more about our church. It's an opportunity to discover ways to grow, to ask questions and to meet some of our leaders. Our next Connecting Point will meet in Room #5 on Sunday, April 14th from 12:15p.m. - 1:00p.m. Bring the whole family and we'll bring the lunch. You can sign up at our info center on Sundays after the services or by emailing us here.